During the 19th century a system of fortune telling arose in Europe using unnumbered, pictorial cards depicting popular imagery with subtitles in several languages. 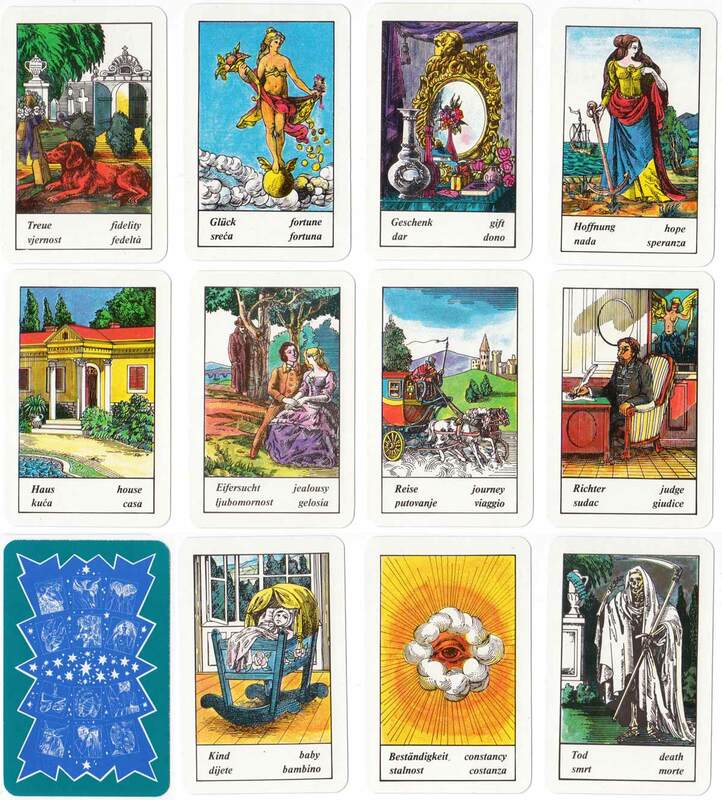 These cards continue to be sold today under various names such as Sehr Feine Aufschlagkarten, Fortune Telling Cards, Gypsy Fortune Telling, Zigeuner or Biedermeier Cartomancy Cards. Many seem to have originated in Austria, but they also emanate from Germany and Hungary. 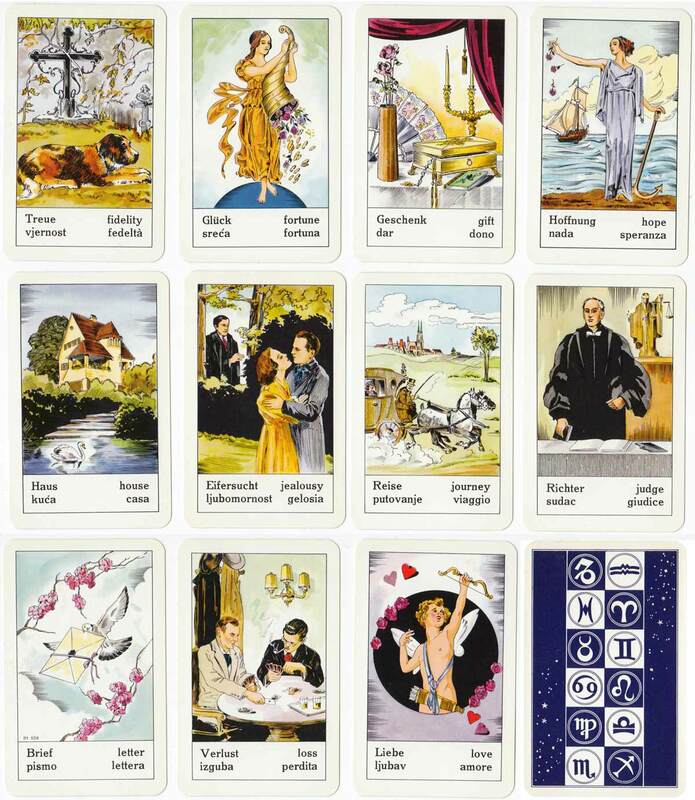 These oracle cards contain several images that were originally seen as vignettes in earlier divination games as well as cartomancy sets devised by Lenormand and her successors, but the whole repertoire has become a distinctive tradition with unique images and a format of its own. They are not the same as Le Jeu du Destin or the Parlour Sibyl. The cards are unnumbered and do not contain playing card insets as the Lenormand type do. The images, which may serve to facilitate clairvoyance or just for light-hearted readings, are allegorical and evocative, presented in a popular style: Hope is a woman with an anchor, Fidelity shows a dog by his master's grave. Inconstancy in the earlier sets, showing a man and a woman quarrelling, is replaced with Constancy, an all-seeing eye (Das Auge Gottes / Oko Boží) in editions by Piatnik published in Vienna and Budapest. 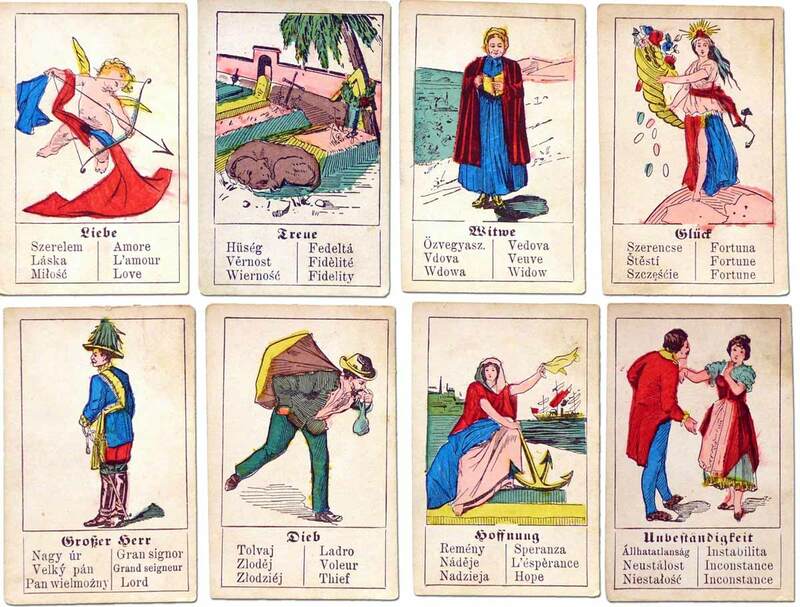 Above: Fortune Telling Cards manufactured in Austria by Wilhelm Hegenauer, 32 or 52 cards with captions in seven languages including English, designed for light-hearted interpretations, hand-coloured, c.1890. Inconstancy is shown here as a man and woman quarrelling. Above: Piatnik Fortune Telling Cards manufactured in Austria. Similar packs were also produced by Fabrik Ferd. Piatnik & Söhne in Budapest. The charming images depict various life circumstances from around 1900. The captions are in six languages. Above: Piatnik Biedermeier Fortune Telling Cards manufactured in Austria. 32 cards. The images are the same as in the above set, depicting life situations from around 1900, executed in the brightly coloured Biedermeier artistic style. The captions in six languages are printed in different typefaces evoking their cultural backgrounds: German, English, French, Italian, Hungarian, and Croatian. Images courtesy Rex Pitts. 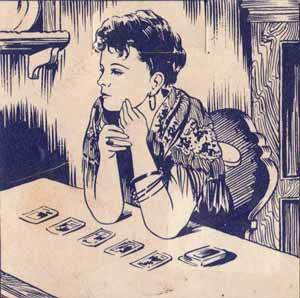 Above: Hungarian Fortune Telling Cards with captions in four languages. 36 cards. 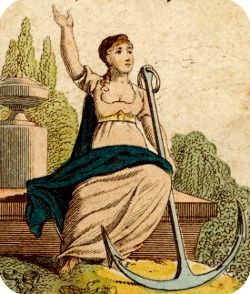 The images, which may serve to facilitate clairvoyance, are both allegorical and direct: Hope is a woman with an anchor, Fidelity shows a dog by his master's grave, Constancy is an all-seeing eye. Some additional images in this example include Widow, Widower, Visit, Unexpected Joy. Images courtesy Rex Pitts. Above: Piatnik Fortune Telling Cards Nr.1 Nr.1902 manufactured in Austria. 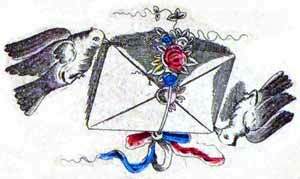 The images were updated into a more contemporary watercoloured pen and ink style of around the early 1900s, and the back design includes Zodiac symbols. 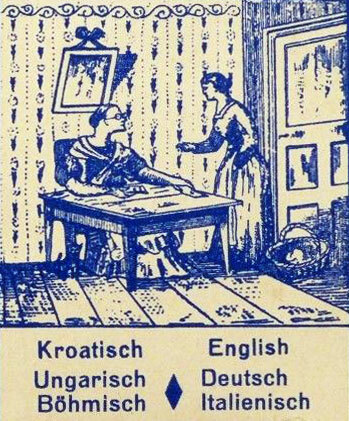 These were also sold in different language editions as “Zigeuner” or “Gypsy Fortune Telling Cards” which adds an air of mystery. Images courtesy Rex Pitts. 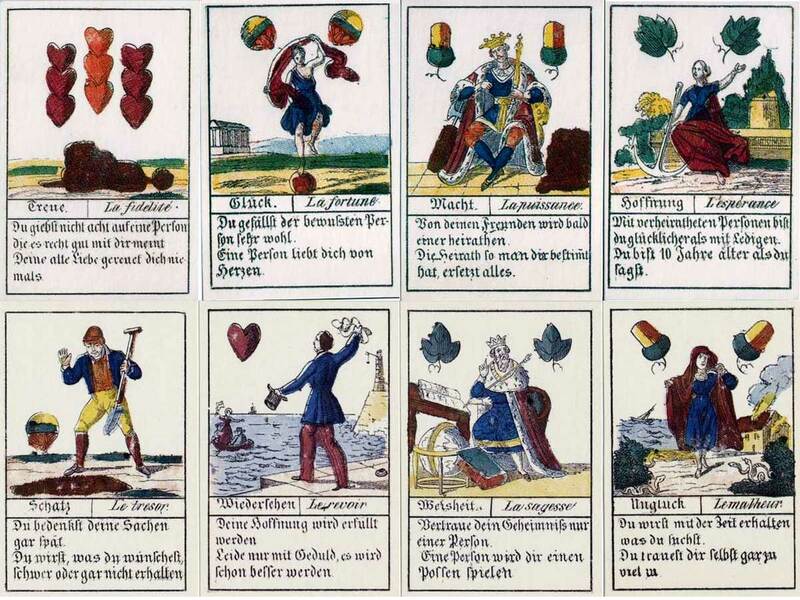 A 36-card deck of German-suited Fortune Telling cards published by Industrie Comptoir, Leipzig c.1818, has inscriptions in German and Polish. There are no miniature playing cards inside the design, but instead the German suit symbols. Similarly, another example was published in c.1830 (below). 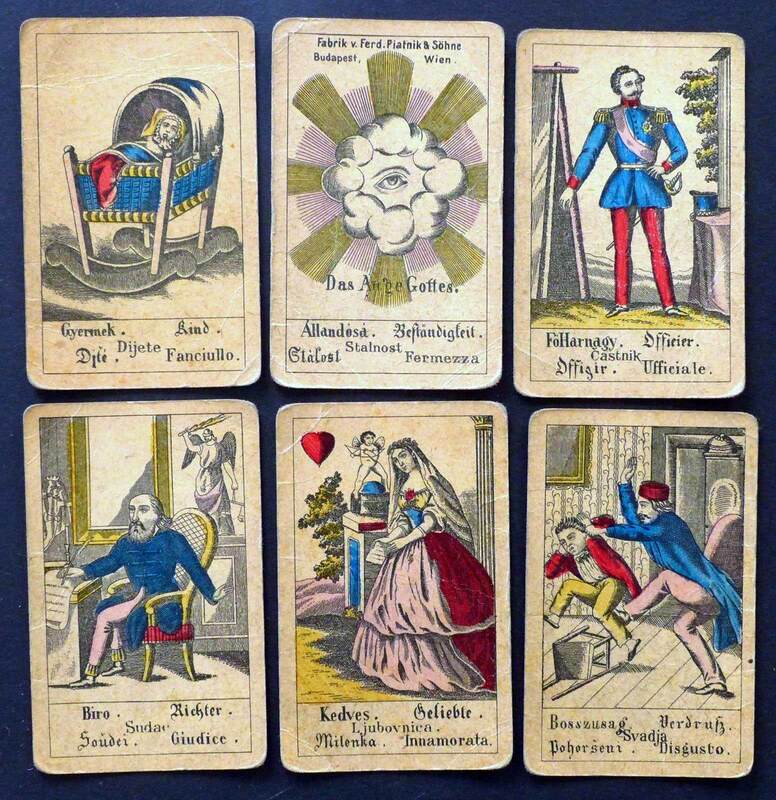 Although these cards have suit symbols and a court hierarchy, the vignettes on the numeral cards are in many instances forerunners of the fortune telling cards shown above. It is likely that the Lenormand type cards also share the same common ancestry and derive from late 18th century cards but have evolved into different styles. 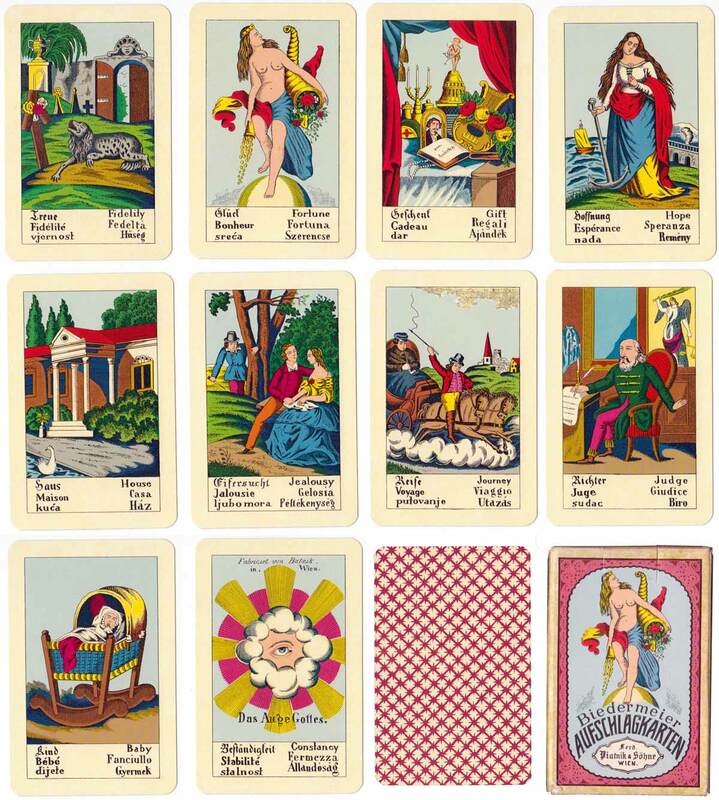 Above: 32-card German Fortune Telling deck manufactured by Industrie Comptoir, Leipzig, c.1830.